A TILBURY-based family is appealing to the local community and beyond in a bid to fund specialist cancer treatment for a 21-year-old woman who faces losing a leg – if not her life. 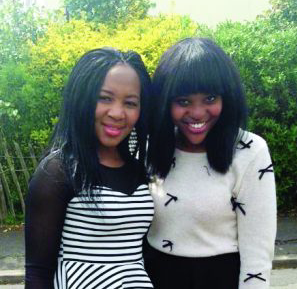 Sabina Makaranga, 21, is battling a rare type of bone cancer and a tumour in her spine and here family believe the only way she can be saved is through treatment at the Proton beam Theraphy centre in Prague. Her mother, Thurrock nurse Ebelinda Makaranga, takes up the story, saying: “I am a British citizen who has lived in Tilbury since December 2002. “I have worked in Thurrock as a registered nurse for all these years. In June this year 2018 my youngest daughter Sabina was diagnosed with Chondrosarcoma of the Spine. This basically is a cancerous tumour which was missed by doctors for more than a year such that when it was found in June 2018, it had grown too big (15cmx12cmx 10cm ) that it was impossible to operate on without sacrificing her whole leg which is called hind quarter amputation. This was not an option for her and l sought second opinion but nothing worked. “I then researched how other countries treat cancer. I was drawn to the Czech Republic who treated the controversial little boy Ayesha a few years ago. The Proton Beam Therapy Centre in Prague said they could try to help treat my daughter. I took my daughter to Prague in October 2018 and they said she could benefit from Proton Beam Therapy. However, the treatment is not cheap. They said they could do 35-37 doses of Proton Beam Therapy on my daughter at a cost of £1,700 a dose which comes to £61500 over a period of seven weeks including consultation. “My family set up a GoFund Me page for people to help me to pay for this treatment. While in the Czech Republic we would need accommodation hence the target of £70 000. “I have also remortgaged my house to try fund for my daughter’s treatment. Sabina’s sister Rachel said: “Sabina is the most incredible person I know, she’s not only my baby sister but also my best friend, from a young age we have always been inseparable and did everything together. She’s the life and joy in our family, anyone who knows her, know that she’s always laughing, smiling and making others laugh.